Thrive+ is an exceptional hangover cure in our opinion. This product is easy to use, has no taste or smell, and has no major side effects. I love that I didn’t have to deal with any side effects at all! I also love that the capsules only need to be taken before bed or also the next morning. I noticed that my hangover was far less painful and my recovery time improved. 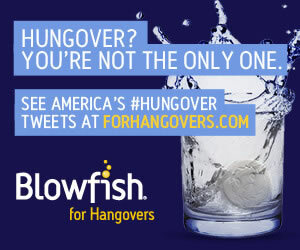 In my opinion, that’s awesome results considering the horrible hangovers I experience. Thrive Hangover Cure is simple to use because you only need to take 3 capsules before bed. They are slightly bigger than average capsules, but they aren’t difficult to swallow. I love that this hangover cure doesn’t require you to take a pill with every drink because I always forget to take them. Luckily, you only need to remember Thrive Hangover Cure before you go to sleep. If you forget, you can take three capsules the next day to help with the hangover recovery time. Obviously, taking the capsules before bed is more effective in reducing the recovery time of a hangover when using Thrive+. I love that Thrive Hangover Cure comes as capsules because there is no taste or smell. They are slightly bigger and lighter than other capsules, so it was easier for me to swallow one capsule at a time. The next morning I woke up feeling better than I deserved. My hangover was so much less than I expected. My symptoms were lessened and my recovery time definitely improved. I cannot say that I didn’t have a hangover at all, but I recovered much faster than when I didn’t use any hangover cure at all. This product contains a blend of vitamins, electrolytes, and antioxidants. For example, it contains Vitamins B, C, and E to replenish the body of vitamins. It also contains Milk Thistle to supposedly reduce liver burden and Ginger Root to soothe the stomach. 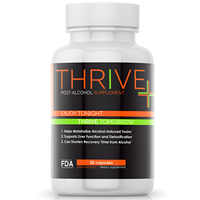 Like many other hangover cures, Thrive+ uses DHM (an antioxidant) which is believed to shorten alcohol withdrawal time. Luckily, I did not experience any side effects with this product, which is a major plus. Thrive Hangover Cure costs $23.99 for 30 capsules on their website. That works out to $2.39 per serving (3 capsules). In my opinion, this is a very reasonable and affordable price. Thrive Hangover Cure will refund you for your first bottle if you disliked it, but will not refund repeat customers. Obviously, I would prefer a product with a money back guarantee, but this policy does seem fair.